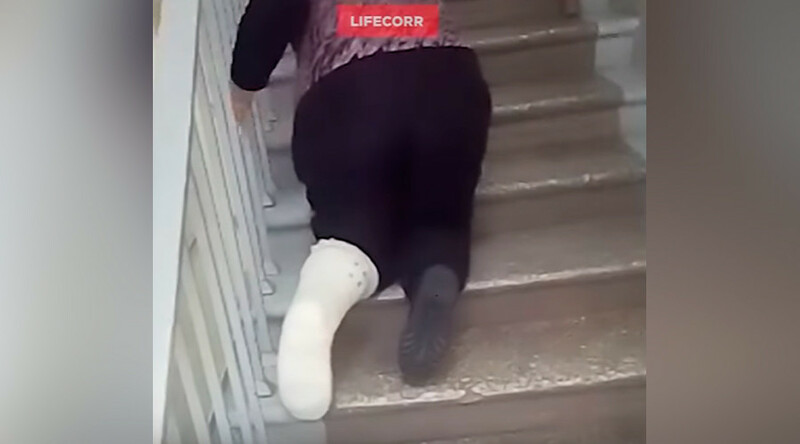 Authorities in the Russian republic of Bashkortostan have launched a probe into a hospital after a video has emerged online showing one of the patients with a broken leg crawling down the stairs after having her leg X-rayed. The republic’s prosecutor’s office said that the hospital, located in the city of Ufa, should have redirected Tatiana Melenchuk to another medical facility right at the reception desk. However, for some reason, it had not done so, which allegedly forced her to crawl up 28 stairs to the second floor to have her leg X-rayed before returning back in the same humiliating manner. “The prosecutor’s office is to see if there are any violations of the health legislation and make sure that the clinic’s administration is providing the patients with access to the medical services and that the elevator equipment is working properly,” Bashkirian deputy prosecutor Guzel Masagutova told RIA Novosti. The shocking video of Melenchuk crawling down the stairs using only her hands was filmed by her daughter, Irina Talipova, who was unable to help as she had her spine broken in a traffic accident back in November which left both women crippled. The footage apparently shows the moment Tatiana, who looks like she is in her 60s, is returning to the ground floor after the procedure. Other people are seen walking past without paying much attention. “It turned out that the elevator in the clinic was out of order and there are no ramps. My mother can’t put pressure on her left leg and her right one practically doesn’t function,” Irina told LifeNews, adding that Tatiana has recently had a surgery on her leg and needs to be followed up by a doctor. “We asked a nurse who was passing by to help, but she said that it’s our own business and we should go the head of the clinic,” Irina said. Apart from being practically immobile, Tatiana is suffering from having only one kidney. She is only able to move only with the help of a walking frame. “When nothing was working out, I went hysterical – right there, on the stairs. Yes, that was tears from insult, sorrow and my helplessness. Then I somehow managed to pull myself together and began crawling up the stairs, in tears,” Tatiana said, as cited by the Bashkir satellite television (BST). The deputy head of the hospital, Olga Vikhareva, told BST the incident, which has since been making waves on social media, could have been easily avoided if the hospital was alerted beforehand of the patient’s condition. “If we had been approached, we would have immediately sent her to Nezhenskaya street [the nearby hospital] wherever she would have easily done her X-ray. And there would be no problems,” Vikhareva said. However, Talipova told LifeNews that her attempt to reach out to the senior officials at the hospital was not successful. “We tried to call the clinic chief but no one answered,” she noted. The distressing video has drawn widespread condemnation in Russia, with people taking to social media to voice their resentment. “I was surprised by the video from Ufa, where a woman is crawling to the second floor to get her broken leg X-rayed and nobody helped her. Shame on the doctors of this hospital,” Lala Masimova wrote on Twitter. Meanwhile, the head of the hospital, Radif Sabirov, said he does not believe that none of the medical staff at his facility came to the woman’s help, vowing to launch an internal investigation into the incident.